Every year we throw a Halloween dinner-party, and every year we change up the theme. Everything from the invitations, the food, the games and even guests costumes go along to match. And every year I realize how wonderful our friends are to go along and humoring me, and as you can imagine, we always have a great time! So after having themes like: Famous Couples, Clue, Harry Potter (Courtesy of my super talented cousin Colleen) and Mrs. Havasham AKA the creepy bride who never married (based on the book “Great Expectations” by Charles Dickens.) We decided to go with the more traditional theme of:Pirates. I’ll of course go into more detail over the next couple of posts, but for this one I wanted to show you my front porch, entry way and bannister decorations. 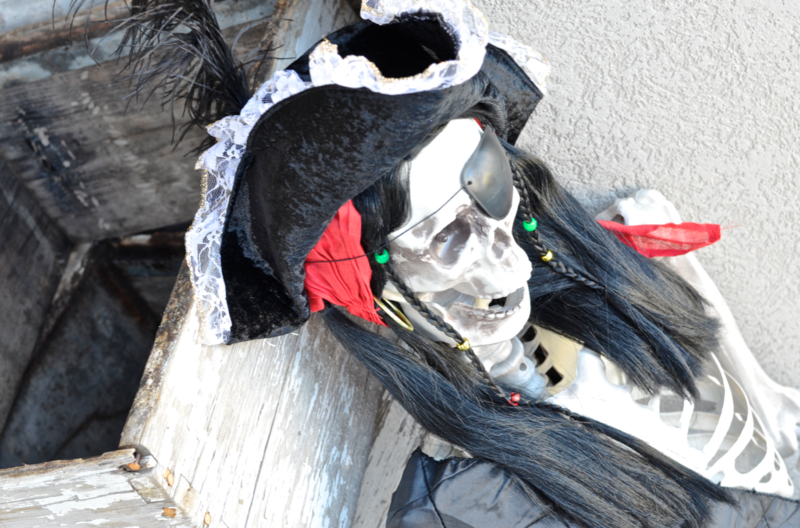 For the front porch I used this life-sized skeleton I found at The Home Depot and the sword and eyepatch, wig, pirates hat and bandana are from Amazon. I just set it up like a pirate was having a nice drink of sparkling cranberry juice (totally something a real pirate would drink… obviously) protecting a treasure map when some pirate curse swept by and left him, a whole lot skinner and really showing-off his bone structure. Curse me with that, am I right?! In place of a wreath I have some black cheese cloth holding bones and skulls. It adds a nice touch to the whole pirate theme, its welcoming in a “watch-your-back, you’re next” kind of way. For the bannister, I used black tulle (you know that $.98 stuff from the fabric store,) spiderwebs, black feather boas, dollar store strings of skeletons, striped ribbon to hold it together and beads from my Christmas decor to create the fanciest pirate-skeleton bannister you’ve ever seen. This amazing pirate painting was a thrifting find and all I had to do was paint the frame gold! Did I mention I only paid $2 for this gem? Its easily my favorite find for any party I’ve ever done (possibly because the $2 price tag!) I think I actually shouted “NO WAY! ?” when I was sifting through the art section of the store. Don’t you just love when that happens? To tie in the coffee table and existing painting, I just added black cheesecloth, tea light candles and filled that gorgeous glass box with some Spanish moss and bones. For the painting I just placed a black skull from an old halloween garland and stuck it on with museum putty. Thanks for joining me on this mini tour and stay tuned for more Pirate themed goodness coming later in the week.